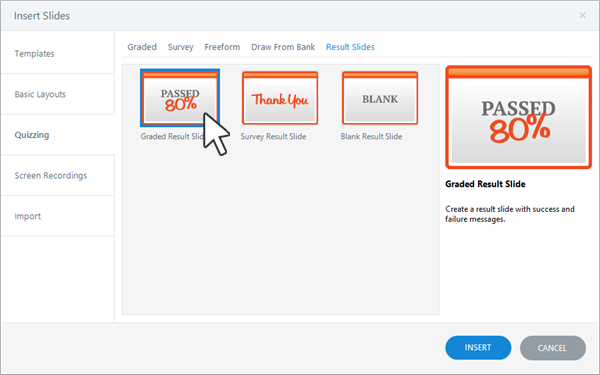 Result slides give learners dynamic feedback at the end of quizzes and surveys. They also send reporting and tracking information to learning management systems, including learners' responses and scores. You can use multiple result slides in an Articulate Storyline course, and even combine them for a composite score. In this tutorial, we'll look at adding result slides and configuring their properties. Press Ctrl+M on your keyboard. Go to the Home tab on the ribbon and click New Slide. Go to the Insert tab on the ribbon and click New Slide. In Story View, right-click anywhere in the workspace and select New Slide. In Slide View, right-click anywhere in the Scenes panel and select New Slide. When the Insert Slides window appears, select the Quizzing tab on the left. Go to the Result Slides tab at the top of the window, then choose the type of result slide you want to add. Graded: Choose a graded result slide when you want to track a score for the quiz. You'll have options to show the learner's score, the passing score, and passed/failed feedback. Survey: Choose a survey result slide for non-graded assessments. Blank: Choose a blank result slide when you need to send completion data to an LMS but want to design it from scratch. For example, you might want to disguise it as a summary, thank you, or standard content slide. Click Insert to add the result slide to your course. 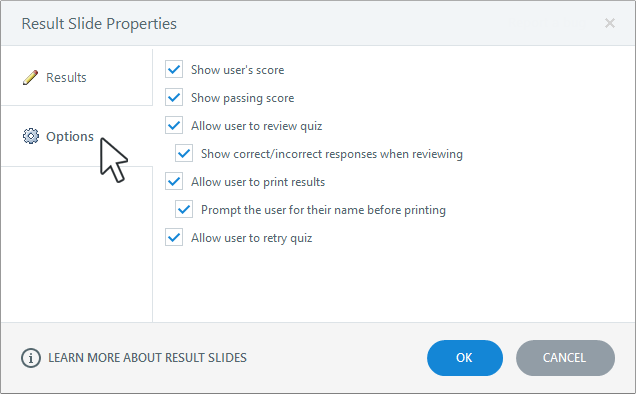 The Result Slide Properties window will appear, where you can identify the questions you want to track, define the passing score, enable the quiz timer, and choose other optional features for your result slide. Selected Questions: Use this option to track individual question slides and question draws. Selected Results Slides: Use this option to combine other result slides into a cumulative score. Then, mark the boxes for the question slides or result slides that you want to track. If you're tracking graded questions, enter a percentage in the Passing Score field. 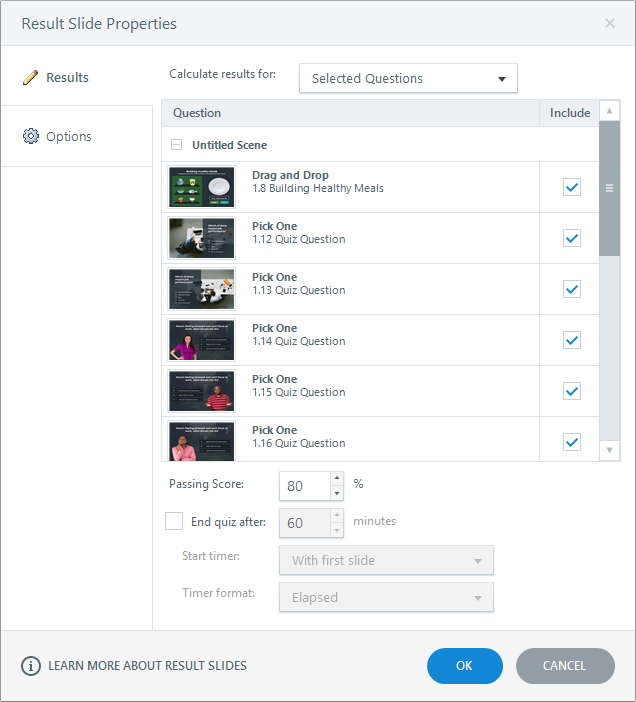 User must pass each quiz: Select this option if learners must pass each individual quiz (represented by the tracked result slides) in order to pass the overall course (represented by the final result slide). If learners fail any quiz in the course, then they fail the entire course. Combine points from each quiz: Select this option if you want the scores from all tracked result slides to be added together as the final score for the course, then enter a percentage in the Passing Score field. In this scenario, a learner could fail one or more of the individual quizzes and still pass the overall course. Tip: When combining multiple result slides into a master result slide, learners will need to visit each of the tracked result slides to complete the course. Otherwise, the course status will be marked incomplete. You can set a time limit for your quiz. Mark the box to End quiz after, then enter the number of minutes you want to allow for the quiz. Use the Start timer drop-down to choose when the timer should start counting down. With first question means the timer starts when the learner arrives at the first question in the quiz. With first slide means the timer starts as soon as the learner launches the course. Use the Timer format drop-down to choose how the timer should display. Finally, choose the items you want to display and the features you want to enable on your result slide. Show user's score: This adds a placeholder to your slide that displays the percentage the learner achieved and the number of points earned. Show passing score: This adds a placeholder that displays the percentage and number of points required to pass. Allow user to review quiz: This adds a Review Quiz button to your result slide, which lets learners go back and review the answers they submitted (but they can't change their answers). To give learners visual feedback on their performance, mark the corresponding box to Show correct/incorrect responses when reviewing. Allow user to print results: This adds a Print Results button to your result slide, which lets learners print out a summary of their results. To include the learner's name on the printed report, mark the corresponding box to Prompt the user for their name before printing. When you're finished, click OK to add the result slide to your course. Can I Edit My Result Slide Later? Yes. Just click the Edit Result Slide button in the upper right corner of the workspace to edit your result slide properties.